A woman in flood water trying to find her way to the back side of her compound. Residents of Ahmadiyya area of Lagos State have expressed concern with the seeming abandonment of road projects in the area since Akinwunmi Ambode lost a second term bid. It is barely three weeks since the Governor of Lagos State, Akinwunmi Ambode, lost a bid for a second term in office in a primary election that looked more like a walkover than a contest, but the residents of some area of Lagos are already feeling the impact of his near exit. What started with joy for the residents of Ahmadiyya area of Lagos State is now turning into another chapter of lamentation. 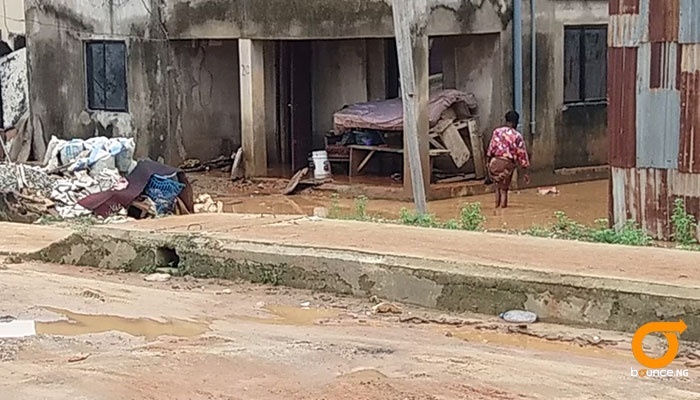 Few months ago, the residents of the area had jumped into jubilation with the construction of almost all roads in the area, but that jubilation appeared to have been cut short by the failure of the Governor of secure a second term ticket from his political party, the All Progressives Congress. Days after Ambode lost that primary, the equipment used by the construction company handling the roads in Ahmadiyya area began to disappear one after the other. All of them have now been moved away, leaving residents to their fate, with a drainage system that has not been completed. Olaleye Street, Gbola Onibiyo, Alhaji Luqmon Avenue, Edun Alaran Road and Apostolic Faith Street among others are under construction, but residents fear the dream of having a good road around the area may have become a nightmare. It was a massive project of the state government meant to easy the pressure on the Abeokuta Express way and also . Most of the roads were damaged by heavy duty vehicles that used them during the construction of Abule Egba Jubilee Bridge. Now, other roads that are good within Beckley Estate have now been damaged because people who leave around where these constructions are happening have resorted to passing through Beckley Estate. The case of residents in the area was made worse by Sunday night rain. At Alhaji Luqmon Avenue, compounds were flooded because of the drainage system that has not been completed. A woman was seen walking in the flood water, trying to find her path to the back side of the building. She lamented that the construction, which was now seemingly abandoned, had become a problem more than a solution it was meant to provide. Bama Hotel, which is along Edun Alaran Road has shut down because customers could no longer access the hotel. The workers have been asked to go home, but the building maintenance cost is eating deep into the owners pocket. Most of the roads are left in the level of sand-filling and the muddy red sand is making movement withing the streets impossible. Residents are now in dilemma, not sure the roads would be completed before Governor Ambode leaves. Will Ambode tell the contractor to return to work or will they continue to hope the next administration will remember them and finish up the road?